Fossils don’t form in frigid environments. So why is this arctic archipelago full of them? 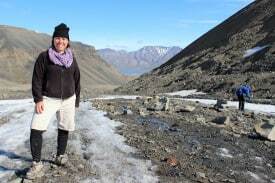 Kattina Rabdau-Fox goes fossil hunting in Svalbard. My guide points to a ribbon of rocks and debris along the edge of Lars Glacier, one of two glaciers that loom over Longyearbyen, the capital of the Svalbard Archipelago in the Arctic Ocean. This chain of islands lies between 74 and 81 degrees north latitude. Despite its position as the last landmass before you reach the North Pole, its rocks belie a history of warmer climates and massive uplift. Svalbard’s islands are rich in fossils because the land is rich in coal. But coal is the result of biological productivity. It can only form in places teeming with life. For much of the year, Svalbard’s ecosystem is virtually dead. The largest plant here is a shrub that grows only a few inches high. The Svalbard Archipelago was first mapped by Dutch explorer Willem Barentsz in 1598, as part of his mission to find a northern passage, but sea ice beat him and his crew back time and time again. While explorers couldn’t bridge the Orient to Europe, an early discovery of high-quality coal made Svalbard a place worth establishing a foothold. American industrial mogul, John Monroe Longyear set up the first mine on the islands in 1906. 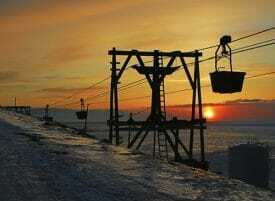 Norway and Russia soon followed, opening mines of their own. In this frigid climate, biological productivity happens only between June and August, and only in the space between the cliffs and the water. The rest of the island is locked in ice and rock. Coal can’t be made in a polar environment, yet for centuries, the coal mining industry here flourished. Why? Because Svalbard hasn’t always been locked in ice. Between 100-million and 25-million years ago, climate conditions were warmer in Svalbard. Vast swamplands were home to forests of deciduous and conifer trees and shrubs. Nerd Break: Coal is sometimes called “buried sunshine.” As forests grow, they lock up the sun’s energy in their leaves and branches as carbon. Once the plants die, their remains sink to the bottom of the sea. Their carbon becomes compressed. Water is then squeezed out over time. In most coal, you can’t see different leaf imprints, but in special circumstances, pressure doesn’t destroy the plant structures. It instead preserves them and turns them into fossils – perfect casts of the original plants. The slushy edge of the Lars Glacier is full of fossils. Glaciers fight a war of attrition against the land, scouring the mountains and moving massive boulders and rock flour in slow motion. The result is a lumpy landscape of loose rocks and ice. We pick our way along the glacier’s edge, turning over rocks in our hunt for fossils. A block of rock two meters across sits among the debris. Its entire surface littered with fossilized leaves that lived 60-million years ago. Fossil hunting is a treasure hunt. After three hours, I return with a booty of ancient oaks, redwoods, and maple. Nearby islands in the archipelago have a variety of seafloor fossils and ancient aquatic dinosaurs. At this time, there is no limit to the number of and size of fossils you can take from the zone near Longyearbyen. The only factor to consider is your luggage weight limit! Blocks larger than your fist must be placed in checked luggage. If you put them in your carry-on bag, you’ll end up forfeiting them to airport security. Fossilized needles from a conifer tree. Fossil hunting adventures can be arranged through a number of vendors including Spitzbergen Outdoor Activities and Green Dog. Visitors are strongly advised to use guiding companies to ensure both their own safety and protection of the natural environment. Minimally, guides come with some training about the natural landscape and speak English. More importantly, they are qualified to use a rifle if you encounter a polar bear. 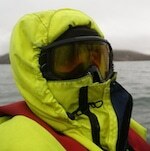 My guide from Spitsbergen Outdoor Activities was a friendly university student who studies birds. She wasn’t the most enthusiastic guide, and her understanding of fossils here was minimal. If you’re looking for an in-depth geology walk, consider contacting vendors prior to booking to find out their level of training. Kattina Rabdau-Fox teaches seventh-grade science at the Singapore American School. She is married to Globejotting.com founder Dave Fox, but please don’t hold that against her. Do you have travel tales to tell? Globejotting.com is looking for guest contributors! Check out our writers’ guidelines for full details. Want to break into travel writing but not sure where to start? We also offer super fun, wildly informative, online writing workshops! 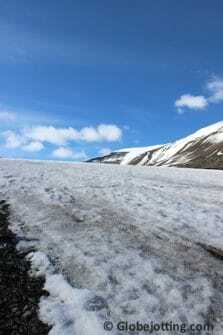 The Svalbard Maxi Taxi Tour: Get Ready for a Wild Ride!